We were Cheese! Somewhat exhausted, but soo happy we cherish the memories of that wonderful weekend. We had planned, organized, dreamed, hoped – and you came. 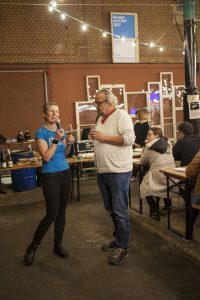 Shepherds, farmers and cheesemakers from Brandenburg to Toggenburg and Anatolia, cheesemongers and affineurs from Berlin to Antwerpen and London, and just as important: tasters, aficionados, and all those interested in cheese from far and wide. 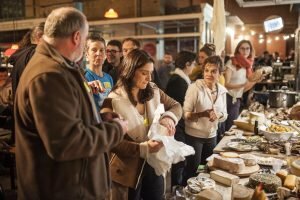 Together we filled the Markthalle Neun with cheese. With people and their stories, with delicious bread to enjoy with the cheese, boards to cut it on, and bags to carry it. We had the kids shake butter and mix cream cheese, and their faces painted into little sheep and goats. 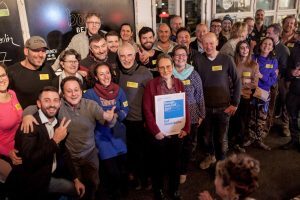 We tasted and watched movies, we savoured wine and craftbeer with the cheese and opened the windows onto Hof Marienhöhe, our honorary awardee. I am deeply grateful for your energy, time and dedication, which I do not take for granted and which gave us those inspiring days full of discourse, exchange and togetherness. 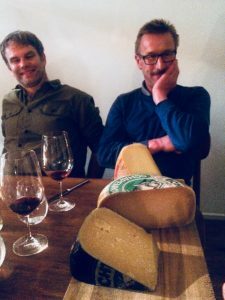 Here is a (not so) short look back at the Heinzelcheesetalks, which were mostly, but not exclusively about this year’s focus on the Alps and mountain cheeses. On Friday night we started with a premiere, Heinzelcheesekino: we watched Dominik Flammer’s beautiful documentary about ancient alpine cheeses at the nearby Eiszeit-Kino, then, with the pictures of mountains and dairies fresh on our minds, we walked back to the market and tasted exactly those same cheeses, with some producers present and Dominik commenting. There was Bloderkäse, fresh and mature, from Thomas Stadelmann from Toggenburg, Daniel Mangeng’s Surakees from Montafon, Ahrntaler Graukäse from Mittermaierhof and Ziegen-Graukäse from Goasroascht in Sand in Taufers/Alto Adige as well as Mascarplin from Sennerei Sufers and Glarner Schabziger from Graubünden. Obviously we had to drink as well: Berliner Weiße (wheat beer) from Heidenpeter, Müller-Thurgau from Schloßgut Bachtobel in Weinfelden/Thurgau, Spätburgunder Weißherbst and Sauvignon Blanc from Staatsweingut Meersburg, Räuschling from Weingut Hasenhalde on Lake Zürich and finally Weißburgunder from Weingut Unterortl Castel Juval in the Vinschgau – all intriguing pairings. And a very intense, inter-alpine discussion with that – fantastic. The fun continued on Saturday. This year many makers and mongers had joined us from Friday morning on and the market had a wonderfully cheesy feel to it. In the afternoon I offered you two cheese talks. 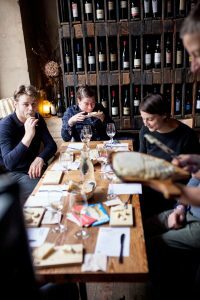 First a kind of personal shopping guide focussed on hard mountain cheese – what’s not to be missed? We hiked from dairy to dairy (Helmingen, Loch, Untere Falz, Obere Falz, all in Bregenzerwald), then made a detour to the Allgäu and the Lehern dairy, from there hopped over to the Swiss Emme valley, finishing with Mängisch from Jamei, in the French part of Switzerland. Again, we drank well: Weißburgunder from Staatsweingut Meersburg, Grauburgunder from its immediate neighbour Weingut Aufricht, Riesling from Schloßgut Bachtobel on the southern shore of Lake Constance and from the Dolomites made by Weingut Unterortl Castel Juval in the Vinschgau and to finish a Bavarian craft beer, Fuchs Teufelswuid DIPA made by Markus Hoppe in Waakirchen. After that it was an immense honor to welcome amongst us not only Dominik Flammer but also Willi Schmid, longstanding shooting star of modern Swiss cheesemaking. Helped and initiated by Georg Weishäupl of Peppikäse and Dieter Gwosdz of Schweizerweine he shared his immense knowledge and experience with us. 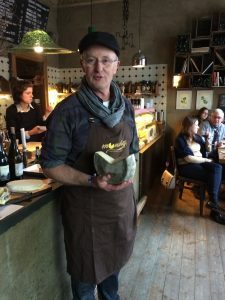 We enjoyed Caprinello („Pecorino“ made from goats milk), goats Reblochon, Bergmatter and Weiser Büffel (a buffalo cheese), spruce bark-wrapped cheeses made from cows, sheep and goats milk as well as Jersey and buffalo blue cheeses. And just as if this wasn’t enough we paired those delights with Carato Bianco and San Carlo from Delea in Ticino and Cornalin and Ermitage fletrié from Albert Mathier from Valais. Thank you, friends from Switzerland! Switzerland was also where we started with the first cheese talk at 11am on Sunday, the big market day, at wine bar Gallina across the street (after we all met and bonded during the makers‘ and mongers‘ Get Together on Saturday night): Konrad Heusser from Mundig had assembled a fascinating selection of soft Swiss mountain cheeses, and told us about the people and stories behind them. Just as impressive: the natural wines from the Jura which Holger Schwarz from Viniculture himself poured and presented. Again, some amazing pairings: from Michel Béroud from Rougemont/Vaudois came Dzorette, Tomme Fleurette and K-Ré, from Fromagerie Le Sapalet in Rossinière/Vaudois a sheep brie. Florian Spielhofer from St. Imier in the Jura was presented with the Oeil de Crosin, but also involved with Agnès Béroud and Le Galait. This was followed up by Nufener Mutschli from Graubünden, Vacherin Mont d’Or from Les Charbonnières/Vaudois and finally Maria Mayer‘ Arve, with spruce needle tips from Andeer. It suited the very special Sunday ambiance to have Crémant du Jura, GPS and Chardonnay “A la Percenette“ as well as Cellier de Chartreux from Domaine Pignier in the glasses, followed by Pinot Noir from Domaine les Dolomies, poured from a magnum. A magic morning. And those were only the Heinzelcheesetalks! Find a list of all participants and more about our new Cheese Berlin Honorary Award, Fenster zum Hof (window onto the farm) on our newly designed beautiful website – this year the award went to Hof Marienhöhe near Bad Saarow and we were more than happy to present it to their cheesemaker Katharina Goldammer herself on Saturday night. The next big cheese meeting will be the Käsefestival in Sand in Taufers, March 9-11, 2018. 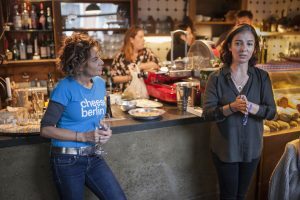 And then, soon, it will be Cheese Berlin 2018, November 2-4 – hooray.